The inflammatory hypothesis of cognitive aging and neurodegeneration has received considerable attention. Indeed, several lines of evidence indicate positive association between inflammation and age-related cognitive decline and thus support the potential role of inflammation in the risk of dementia. 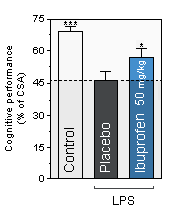 NEUROFIT offers a translational in vivo model of inflammation-induced cognitive deficit. 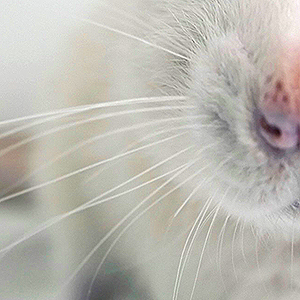 Inflammation is produced in mice by single administration of a non-septic dose of LPS. The model has proved to be useful in demonstrating the clinical effect of drugs or compounds of different mechanisms. 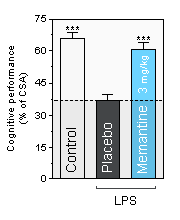 The examples below show the amelioration of the cognitive function of LPS-mice by drugs used in humans for the treatment of Alzheimer's disease. Cognitive performance is assessed as the level of spontaneous and continuous alternation in the T-maze. A lower alternation score represents lower cognitive performance.